The CO2balance team in Uganda conduct monthly visits to the boreholes to visit the communities, listen to feedback and carry out repairs. In February they met Gloria, who is the caretaker of Aminalucu borehole in Dokolo District, Northern Uganda. Gloria is 39 and married with 5 children. She lives in Dokolo District – Lango, Northern Uganda and is a water user of Aminalucu Borehole owned by the community and under the maintenance of the CO2balance Uganda Safe Water project. She serves the role of the borehole caretaker on the water user committee and is responsible for the hygiene and use of the borehole by other water users. She lives approximately 100 meters away from the borehole and takes about 30 minutes to collect water adequate to meet their daily domestic water demand. Due to the proximity of the borehole to her household, she collects water 2-3 times a day which serves her entire household for all their basic needs. ‘Before CO2balance rehabilitated Aminalucu borehole, my children and I used to travel over 4 kilometres to a seasonal open well and would spend a lot of time collecting water, leaving other home duties unattended to. Due to the distance to the only water source we had, we would only make one trip to collect water which was not enough for our family needs’ narrates Gloria. ‘I am using the time saved to offer my labour to farm owners who will pay me as I plan on starting a poultry business with the money saved so that I can generate more income for my family needs. I am also happy with my position as a caretaker of the borehole because it has earned me respect in society and among my friends. With the time saved I am also able to attend water user committee meetings and contribute ideas towards the maintenance of our borehole’ concludes Gloria. At the moment Gloria is a maize farmer and, with the time saved by the borehole project, she’s been able to build a granary for storing the harvested maize. Gloria is happy that now she has enough time to engage in other domestic and productive work like cooking, cleaning, collecting firewood, washing and there is no more domestic violence in their home. Her children are able to attend school and she’s hopeful that they will perform better at school. The Uganda Safe Water Project offers so much more than clean water. The time saved offers women the opportunity to engage in income-generating, leisure and social activities, as well as serving the community as part of the borehole committee. As mentioned by Gloria, the burden of collecting water is eased for children, who are then able to spend more time in school. Last week, I received confirmation that I obtained a high pass in the GHG Management Institute’s course in Organisational Greenhouse Gas (GHG) Accounting; this is part of our constant efforts to upskill the team so that we can continue to work to the highest standards. All our business reports are produced in accordance with the internationally-recognised GHG Protocol as part of our 3 steps of carbon management; Measure, Reduce, Offset. We encourage non-state actors to play a leading role in the global effort to limit Global Warming to below 2°C, while aiming for 1.5°C, following the Paris Agreement. This is in line with the Gold Standard’s ‘Best Practice Corporate Climate Action’ with the principal message being ‘reduce within, finance beyond’; the guidelines encourage corporates to mitigate their own emissions in line with science, while also supporting developing countries and the global economy to transition to a low-carbon future. With so many new initiatives for businesses, it is easier than ever for a company to assess and recognise its impact, measure and target where to reduce internally, whilst also supporting communities and efforts to reduce the global impact. The benefits for companies go beyond energy saving and improving the bottom-line; businesses can gain recognition for their actions, and reduce exposure to carbon taxes or other future legislation. CO2balance remain at the forefront of these efforts, helping to recognise carbon as a resource to be managed and leveraging the benefits of doing so. Forests influence climate, landform and soil composition and they exist in a wide variety. Each forest type has its own uniqueness and together these forests complement one another and perform the various socio-economic, ecological, environmental, cultural and spiritual functions. Forests remain vital sources livelihood and water to many people across the globe. East Africa’s forests are rapidly declining due to pressure from population increase and other land uses. In Kenya the case is not different, destruction of forests has occurred at an alarming rate. This puts so much strain to forests that are supposed to support over many people depending on the natural resources emanating from them. Forests are destroyed due to many different reasons and wanton and deliberate destruction of forest for fuel wood remains one of the main reasons resulting to virtual depletion of forest vegetation cover. In the long run this has in return resulted to drying of rivers, soil erosion, scorching sun, human-wildlife conflict etc. Local communities have due to the negative climatic changes become even more dependent on the forest for their livelihoods, causing a vicious cycle of poverty. Women and girls move longer distances in search of fuel wood and water, exposing them to danger of attacks and sexual assaults. With the loss of flora and fauna, tourism income is dwindled, bringing the curio business down with it. Having critically examined effects of climate change Carbon Zero Kenya understood clearly that the challenges facing Kenya’s forests required several approaches and efforts to plant more trees alone would not help if more trees were still being cut at high speed for firewood. To this effect Carbon Zero introduced energy efficient cook stoves in various communities in Kenya that came to replace traditional three stone stoves. This has indeed resulted in immense savings in terms of the wood being used for cooking ultimately reducing pressure on the forests giving them a chance to restore themselves for the past four years. Traditional three stone stoves are criticized for their inefficiency in fuel consumption. Traditional wood fires are inefficient at transferring the released energy into the cooking vessel. Most of the released energy in the wood is wasted heating the surrounding air rather than heating the cooking vessel. The inefficient transfer of energy requires the user to use more wood fuel, increasing the amount of wood harvested from the surrounding environment – this leads to high levels of deforestation. The increased demand for wood can further deplete the already stressed local natural environment. Carbon Zero Kenya has been on the fore-front of fighting climate change in Kenya and beyond through the use of more fuel-efficient woodstoves, which are both affordable and easy to use; cutting the amount of risky trips for firewood and allowing more trees the opportunity to grow. Subsequently, burning smaller amounts wood fuel means less smoke will engulf people’s homes and their lungs. This further translates into improved health and time savings for households, in preservation of forests and associated ecosystem services, and in reducing emissions that contribute to global climate change. Budget 2016 – A missed opportunity? We heard from the Chancellor George Osborne yesterday as he set out government spending plans and it certainly offered a mixed bag for the energy and environment sector. It was framed as a budget of long-term solutions, “putting the next generation first”, which was promising following the recent Paris Agreement, however this claim has since received some criticism from representatives of the ‘green economy’. There were undoubtedly some positive announcements and there was an obvious effort to streamline energy efficiency requirements for businesses. Following a consultation on the future of the energy efficiency tax landscape it was finally revealed that the CRC scheme is to be abolished. In the form it has adopted, the CRC is a tax rather than a ‘commitment’ and, recognising this, the levy will be collected through an increase in the Climate Change Levy (CCL) after the 2018-19 reporting year. The obligation for large companies to report on their greenhouse gas (GHG) emissions will remain. In the consultation, GHG reporting through the ESOS regulations was highlighted as a successful driver for energy efficiency investments. CO2balance are conducting a review of our ESOS experience and will publish the results in the coming weeks. A single energy and carbon reporting scheme is to be introduced from April 2019 that integrates the requirements from climate change agreements (CCA), the ESOS regulations and the EU emissions trading scheme (EU ETS). In the short-term, not much will change but a single reporting system and tax will be seen as an improvement for any company negotiating the current overlapping policies and schemes. Those looking for a drive towards a low-carbon, energy efficient future however have found few positives. After the last Budget the CCL also applies to electricity generated from renewable sources who will be impacted by the increase and policies to support and encourage the renewables sector were again, scarce. This dearth is one reason the UK has slipped in the ‘Renewable Energy Country Attractiveness’ table and with the announced tax cuts for oil and gas it does not seem as if the Government has much ambition to climb it again. In the first Budget since the Paris Agreement and in the face of record-breaking global temperatures over the first two months of the year, many felt there was an opportunity to send a strong signal to bolster the ‘green economy’ in the UK. This ‘budget for the next generation’ however, was particularly notable for its failure to mention climate change at all and has left many feeling that, perhaps, this was an opportunity wasted. ESOS requires all large UK enterprises to have an organisational energy audit every four years. In December, the Environment Agency launched its compliance portal through which all submissions must be made in time for the January 2016 start date.In mid 2014, the Energy Savings Opportunity Scheme (ESOS), the latest EU-led compliance legislation was transmuted into UK statute, with the Environment Agency as the key administrators of the scheme. Businesses that qualify for ESOS compliance are required to submit their data before 5th December 2015. Importantly, with this development, businesses can be registered as fully ESOS compliant from 1st January 2015 and begin to make savings from their investment. As of 2015, Lead Assessors managing ESOS compliance are now able to submit finalised data on behalf of businesses. The main role of the Lead Assessor is to ensure that organisations are ESOS compliant and that the recommendations being made are technically accurate and of true benefit to the client. The ESOS organisation is ultimately responsible for the accuracy of its compliance. 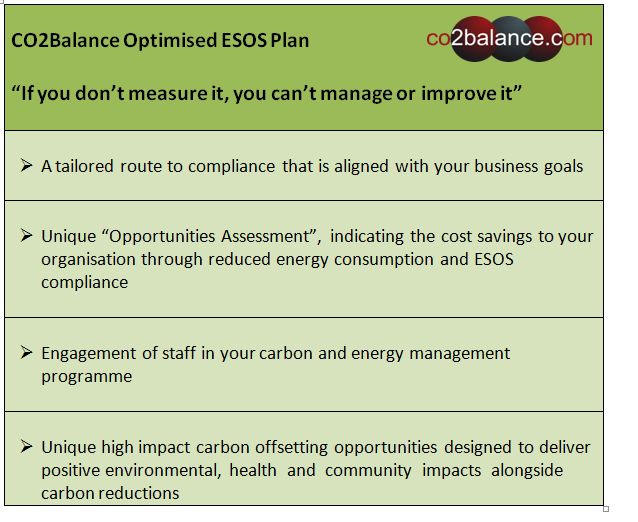 Throughout 2015, using our Optimised ESOS Plan (see above), CO2Balance is mobilising to make savings for their ESOS clients that will result from implementing the measures recommended in their audits. If you are one of the many companies currently unprepared and perplexed for ESOS first off, you are not alone. Approximately 50% of the 9,000 companies in scope are also in your position. Even here at CO2Balance there are still many questions to be answered on ESOS and the energy efficiency policy landscape in general in the UK. However we are here to help and guide you through your ESOS compliance and energy performance in 2015. For further information please contact Paul Chiplen, to learn more and get ready. Some you may be aware of the Government’s new Energy Saving Opportunity Scheme (ESOS), which forces “large undertakings” to audit their energy usages and report them to the Environment Agency. The concept is that through activity managing your energy usage it will open up your eyes to potential areas of energy savings, which has the “double whammy” of saving money as well as carbon emissions. ESOS has been created in response the EU Energy Efficiency Directive (2012/27/EU). In layman’s terms it is an assessment of your energy consumption, so very much like the Greenhouse Gas Audits that we regularly carry out for our clients. You have to comply if you are a “large undertaking”, meaning that you…. You need to submit your data to the Environment Agency by 5th December 2015, but as ever preparation is vital and it is important to start looking at the way you collect and manage your data as soon as possible. As ever with new schemes such as this there are lots of holes that need to be finalised and definitions to be clarified; we’ll post more articles on the scheme as they are made public, along with more information about how we can support you to ensure that you are fully complaint – if you have any queries in the meantime then please get in touch.